le chaudron de vulcain – August 26 , 2018. EN. Italy / Sicily : Etna , Papua New Guinea : Manam , Philippines : Kanlaon , Indonesia : Ibu . Home / blog georges Vitton / August 26 , 2018. EN. Italy / Sicily : Etna , Papua New Guinea : Manam , Philippines : Kanlaon , Indonesia : Ibu . 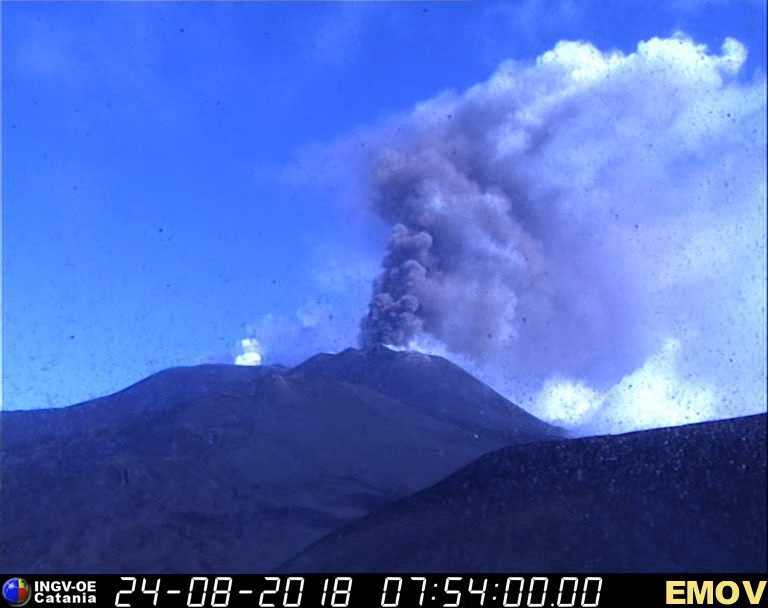 After waking up in July and the gradual intensification of eruptive activity towards the craters of the summit, Etna began producing a new episode of Strombolian activity and emitting lava flows on the night of the 23rd. August 24th. 2018 (Figure 1). Figure 1. Strombolian activity of the new crater South-East of Etna at 4:40 local time of August 24, 2018, seen from the South. Photo of Boris Behncke, INGV-Osservatorio Etneo. Late in the afternoon of August 23, a sudden increase in the amplitude of volcanic tremors (Figure 2) announced the beginning of a low explosive activity from what is called the « saddle », half -walk between the old cone of the crater of the South-East and that of the new crater of the South-East. Figure 2. Diagram of the average amplitude of volcanic tremor recorded by the seismic station of Mount Frumento Supino (about 2850 m on the southern flank of Etna) during the activity of the new crater South-East, 23 and 24 August 2018. This activity quickly became almost continuous with launches of incandescent lava bombs up to about 100-150 m above the crater. Around 8:30 pm (local time), a small lava flow emitted by another mouth of the new Southeast crater, located on the east flank of its cone, was observed; lava emission was accompanied by sporadic and weak explosions from the same mouth. This flow slowly lengthened towards Valle del Bove (east side), slowing down after having traveled a few hundred meters. 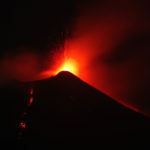 Shortly thereafter, a lava overflow from the « saddle mouth », which was dumped on the north flank of the New Southeast crater cone, began to reach its base in the late evening (Figure 3). Figure 3. Strombolian activity of the new crater southeast of Etna and emission of lava flows to the East (left) and North (right), just before midnight on August 23, 2018. Photo by Boris Behncke. In the following hours, activity continued without significant changes. 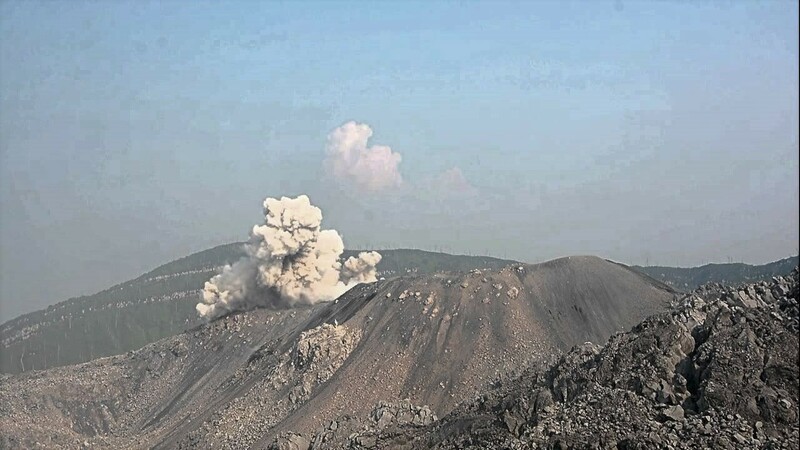 At dawn on August 24, the amplitude of volcanic tremor began to decrease slightly and Strombolian activity was less intense. However, in the morning, a new small lava flow was observed towards the south side of the cone of the new south-east crater, which reached a length of a few tens of meters. After 9:20, a continuous ash emission began (Figure 4), feeding a large plume several hundred meters above the crater. Figure 4. Emission of ash from the new Southeast crater, recorded by the INGV-Osservatorio Etneo visual surveillance camera on the Montagnola, 3 km south of Mount Etna at 09:54 local time (07:54) ). UTC). 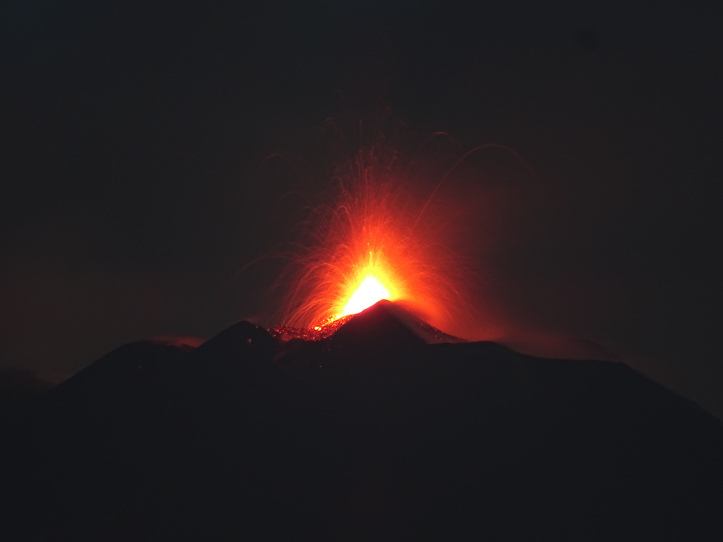 During the day of August 25, the intensity of Strombolian activity at the mouth of the saddle gradually decreased. The ash emission has become weak and occasional. The only flow of active lava, fed by the mouth of the saddle, is that which develops in the North direction and remains confined in the upper part of the Valle del Leone. The amplitude of volcanic tremor remained unchanged at medium-high levels. 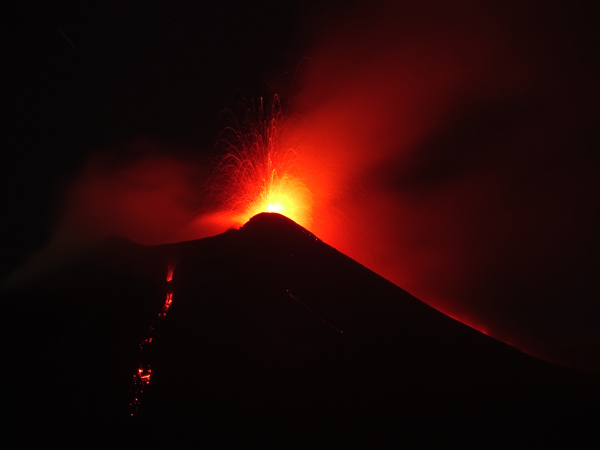 Eruptive phenomena are constantly monitored by the Etneo Observatory of the National Institute of Geophysics and Volcanology. The « mouth of the saddle » was initially formed during a paroxysmal episode at the end of January – early February 2015 and was reactivated during a series of eruptive episodes between February and April 2017. This last activity built a small pyroclastic cone exactly in the area where a deep saddle separated the old cone from the southeast crater of the New Southeast Crater. In fact, the last episode of April 26-27, 2017 had created two other mouths next to the original; it is the northernmost part which is at the origin of the current activity. 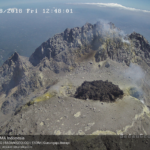 For a few weeks, from May to June 2017, this mouth produced small ash emissions and rare Strombolian explosions; rare ash emissions also occurred between October 2017 and April 2018. 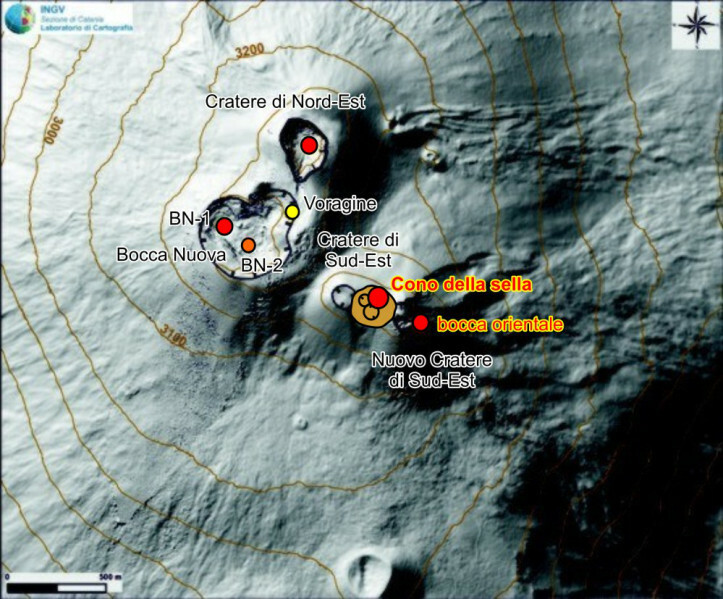 The mouth of the east flank of the new crater of the South-East was however formed at the end of November 2015 and was at the origin of an episode of Strombolian activity and emission of lava flows on December 6th and 8th. 2015. In winter 2017-2018, it has produced many small ash emissions and, since early August 2018, small Strombolian explosions. Figure 5 shows the location of the summit craters and their different mouths (especially in the case of the Sud-Est crater complex – New Southeast crater) highlighting the two mouths in operation since the evening of August 23, 2018. Figure 5. Map of the Etna summits (2014 Base Terrain Digital Model, Rome Aerogeophysical Laboratory, Section 2, modified). The two eruptive mouths of the new crater Southeast active from the evening of August 23, 2018 are highlighted with the writing in red-yellow. The red dots indicate the eruptive mouths that have been the site of eruptive activity in recent days, the orange has a mouth with a possible eruptive activity and the yellow a mouth that degasses but without eruptive activity. Here is a short video of the activity of the new crater of South-East Etna on the evening of August 25, 2018, seen from the Pizzi Deneri, at 2800 m altitude, on the northeast side of the volcano. You can see in the last part of the video the small strombolian explosions coming from two mouths, placed just above the effusive mouth (where the lava came out). There is no sound because there was strong wind. 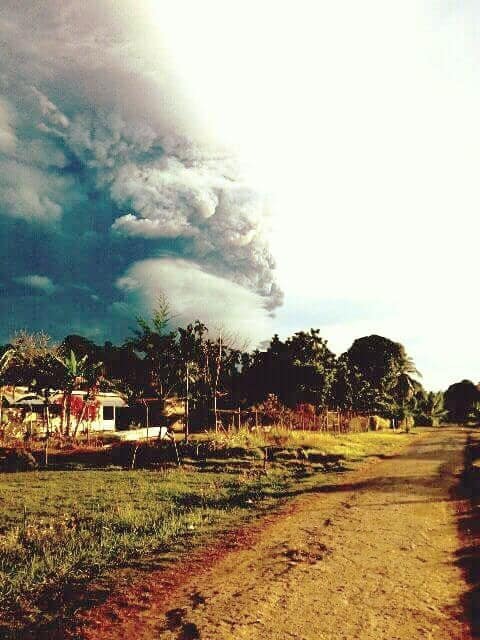 eruption of Manam volcano taken from Bogia mainland, Madang Province. The volcano started erupting at 6:30 am this morning. ERUPTION DETAILS: VA TO FL500, LAST OBS AT 25/0330Z. 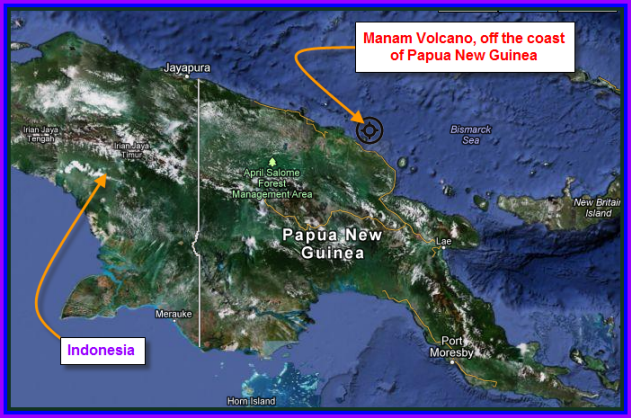 The 10-km-wide island of Manam, lying 13 km off the northern coast of mainland Papua New Guinea, is one of the country’s most active volcanoes. Four large radial valleys extend from the unvegetated summit of the conical 1807-m-high basaltic-andesitic stratovolcano to its lower flanks. These « avalanche valleys » channel lava flows and pyroclastic avalanches that have sometimes reached the coast. Five small satellitic centers are located near the island’s shoreline on the northern, southern, and western sides. Two summit craters are present; both are active, although most historical eruptions have originated from the southern crater, concentrating eruptive products during much of the past century into the SE valley. 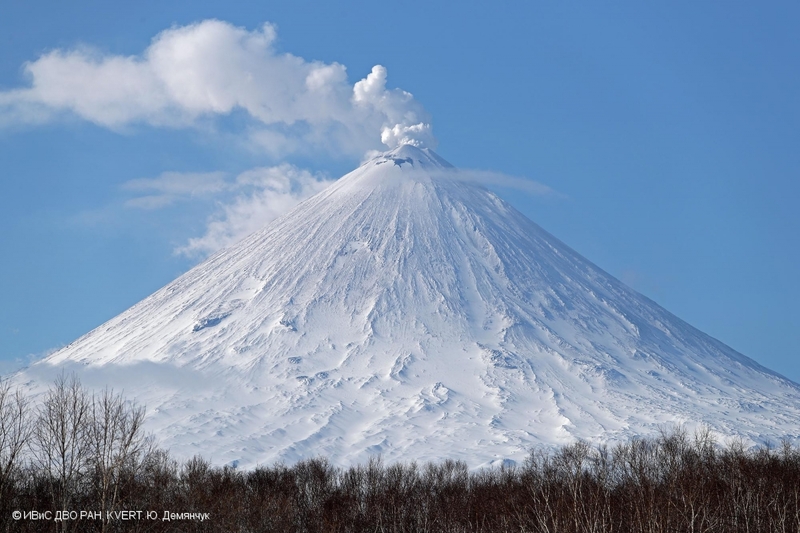 Frequent historical eruptions, typically of mild-to-moderate scale, have been recorded since 1616. Occasional larger eruptions have produced pyroclastic flows and lava flows that reached flat-lying coastal areas and entered the sea, sometimes impacting populated areas. « The volcano, located on an island on the north coast of Papua New Guinea, erupted on Saturday morning, forcing 2,000 villagers to flee from lava flows. 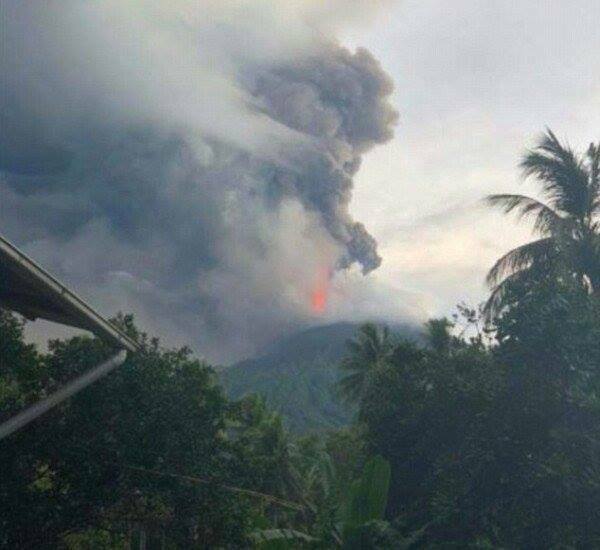 The eruption began at 6 am local time (20:00 GMT Friday), by sending a column of ash to 15 kilometers altitude. The fallen ashes were so heavy that the trees broke under the weight. 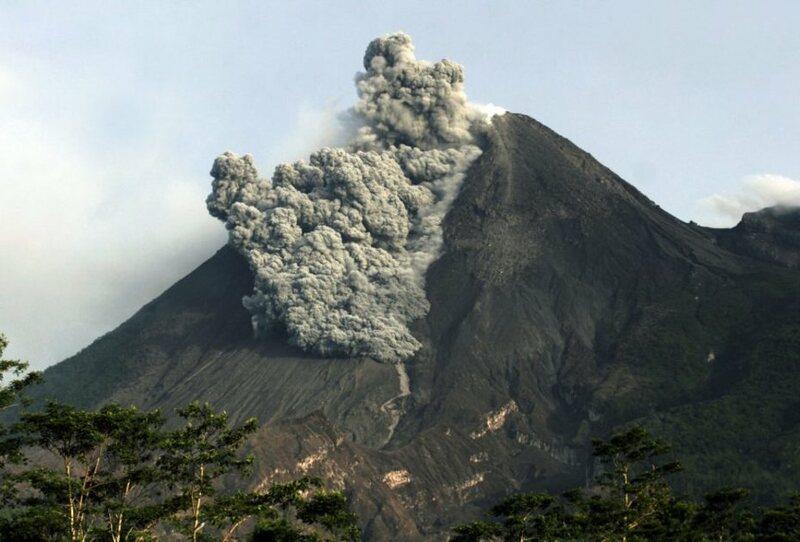 Steve Saunders of the Rabaul Volcano Observatory (RVO) said it was an unusually large eruption. Three villages were directly on the lava road and residents had to be evacuated to safer grounds. 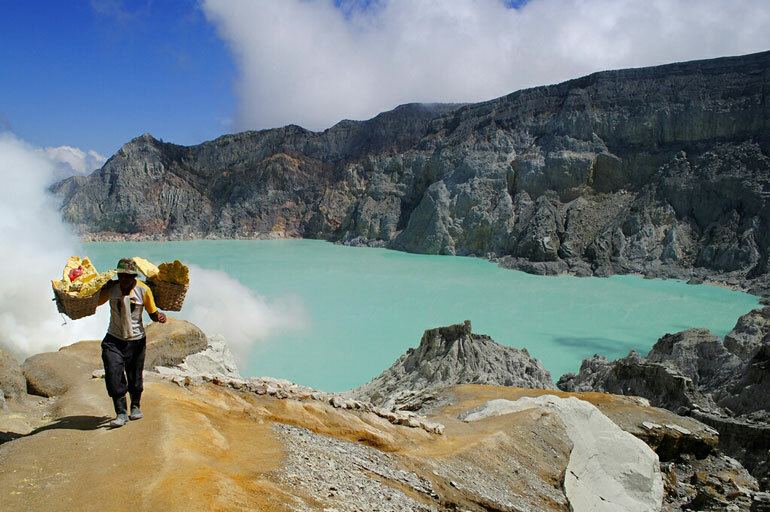 The island of Manam, only 10 km wide, is one of the most active volcanoes in the Pacific and has about 9,000 inhabitants. « The most affected areas are Baliau and Kuluguma, because of the poor visibility caused by falling ash, people use torchlight to move around. There are no casualties of what we know, but tell people to stay away from the valleys because of the risk of mudslides (lahars), in fact there is a thick layer of ashes on the flank and if there is heavy rain, … people know the threat, « he said. The initial phase of the eruption was over, but a new vent had opened, indicating that there would probably be more activity. 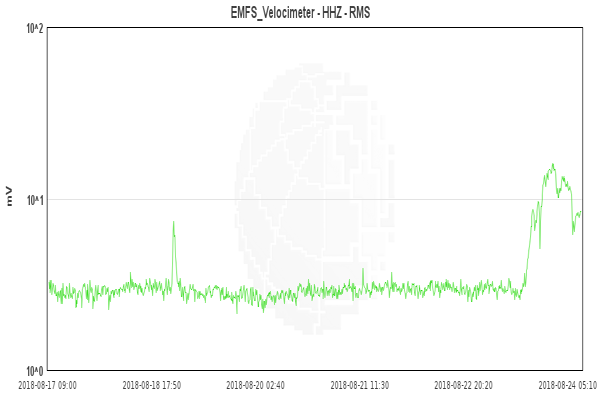 Kanlaon Volcano’s seismic monitoring network recorded seven (7) volcanic earthquakes during the past 24 hours. 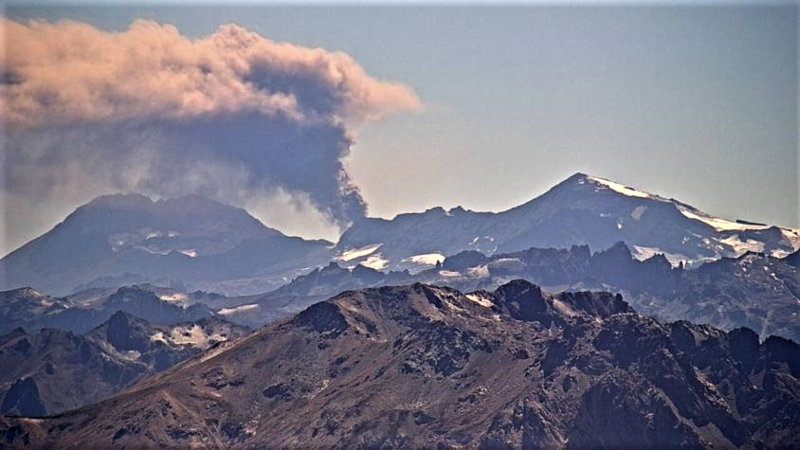 Moderate emission of white steam-laden plumes that rose 100 meters from the summit before drifting northeast was observed. Ground deformation data from continuous GPS measurements indicate a more pronounced inflation of the edifice since December 2017, signifying pressurization beneath the edifice. Sulfur dioxide (SO2) emission was measured at an average of 955 tonnes/day on 23 August 2018. Issued : August 24 , 2018. Eruption with volcanic ash cloud at 08h38 UTC (17h38 local). Best estimate of ash-cloud top is around 6800 FT (2125 M) above sea level, may be higher than what can be observed clearly. Source of height data: ground observer. Eruption is continuing. Seismic activity is characterized by explosion and rock avalanche earthquakes.